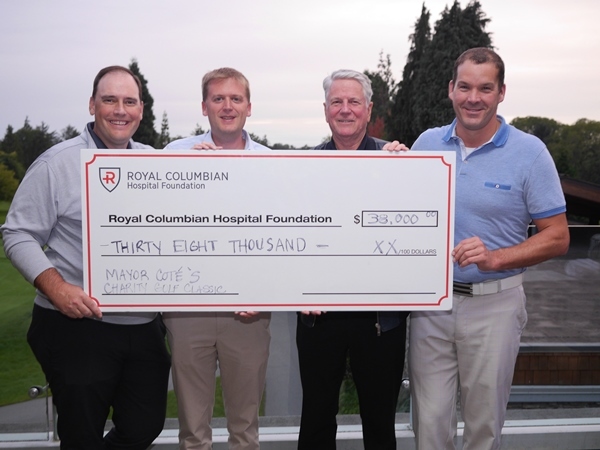 The City of New Westminster and the Terminal City Club have partnered with Royal Columbian Hospital Foundation to raise more than $38,000 for the hospital during the Mayor Coté Charity Golf Classic, held at the Point Grey Golf & Country Club on September 25, 2017. Many thanks to the golfers, sponsors and volunteers who helped make this year’s event a success. Make plans to join us next year on September 24, 2018. Left to right: Royal Columbian Hospital Foundation President and CEO Jeff Norris, New Westminster Mayor Jonathan Coté, Terminal City Club President Grant Weaver & General Manager Peter Jackman.